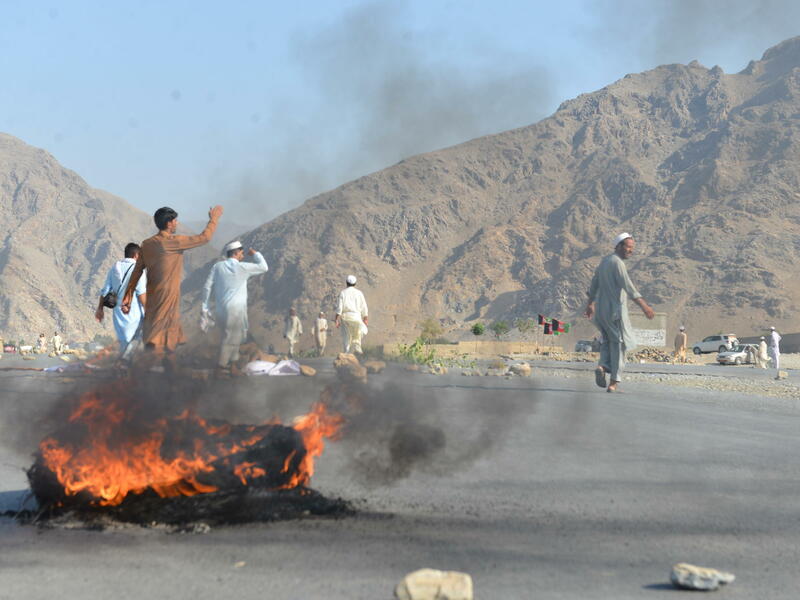 Men shout slogans against terrorists after a suicide attack among the protesters in Momandara district of Nangarhar province, Afghanistan, on Tuesday. Protesters from the Nangarhar province's Achin district had gathered to call for the removal of a local police commander. They accuse the official of involvement in arbitrary killings and robberies, The New York Times reports. Most or all of the dead and wounded are believed to be civilians. Reuters notes, "The attack was one of the worst in Afghanistan for months but security officials have warned that similar attacks are likely if crowds gather for campaign rallies ahead of parliamentary elections in October." The Taliban have denied any involvement and so far, no group has claimed responsibility for the attack. In the past, the Islamic State has claimed similar attacks. "The deadly suicide attack came hours after multiple bombings targeted schools in Jalalabad. "One blast went off at the entrance of Malika Omaira girls' school in the morning, killing a 14-year-old boy and wounding four other people. It was followed by two explosions in Behsud district, also near two schools."